In addition to interior design trade shows, our Long Eaton showroom is open to trade customers and their clients (when referred) by appointment only. It is over 5,000 sq ft set over two floors and is also joined to our factory, where you will be welcome to have a tour of our workshop and see our beautiful furniture being made. Our furniture is typically manufactured within 4 to 6 weeks from order. We generally allow an additional two weeks for delivery to the majority of the UK mainland, therefore most orders are delivered within 6 to 8 weeks. How is your furniture delivered? 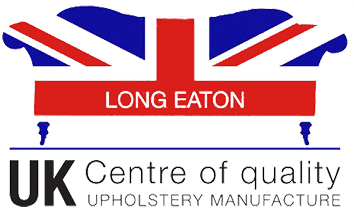 Our furniture is delivered nationwide to the UK mainland by specialist furniture logisitics companies. Our standard trade delivery service is a one man (driver) service to trade addresses only. If required, we can also arrange a direct home delivery (two man) to private addresses. Deliveries to Northern Ireland, Other UK Islands, Europe and The Rest of the World may also be possible. Click to find out more details about our delivery services. Of course you can. We regularly manufacture our furniture in customers own material, as long as it is suitable for upholstery use and complies to the current UK furniture & fire regulations. In some cases, we may require certification. Yes, it is something we do every week for our customers. Please note that we only undertake re-upholstery on our own models and do not offer a re-upholstery service on furniture manufactured elsewhere. Please contact us for a quotation. If I have a picture, or photo of a sofa I have seen elsewhere, will you make it? Sadly, not. All of our designs are registered and we are strongly against the copying of other designs. Some companies may say they will do this for you, but in effect what you will be getting is a prototype. Our frames are made by us in our own wood mill. They are hand-built using seasoned kiln-dried Beech, or birch hardwood from Europe, typically from Scandinavia, or the Baltic States. All joints are glued, screwed and dowelled for strength and all frames come with a 30 year construction guarantee. All of our seats are constructed with metal springs, we do not use elasticated webbing in our seats whatsoever. We use two types of metal springs, mesh-top coil springs in some of our Classic models, with the majority of models having high-gauge tempered steel no sag/zig-zag springs. Our springs come with a 15 year construction guarantee along side our frames. Do you offer different leg and feet options? The majority of models have the option of a dark, or light wood finish. Legs with castors are available with a brass, or chrome finish and without castor if you prefer. We can also offer alternative leg styles on some of our models and work with a few component suppliers where different legs can be purchased off the shelf, for example metal legs. What cushion filling options do you offer? We offer our customers a wide range of cushion interior options to get the comfort just right. Seat cushions are available in foam, fibre and feather. We have two standard seat grades of foam, but we can also order softer, or firmer grades from our cushion supplier if necessary. Fibre cushions can be either Wellman, or Quallofil Fusion. Models that have coil-springs can have the option of 100% duck feather seat cushions and we also offer a fibre with duck feather sprinkle seat cushion on all models. Back cushions are available in 100% fibre, 100% duck feather, or fibre with feather sprinkle. Do you offer any special finishes? Yes, for a small extra charge, all of our furniture can be custom-made with the following special finishes to make it unique: contrast piping, buttoning, studding, skirts/valances and traditional trimmings such as piping cords and fringes. Can you manufacture to special sizes? Yes, for a small extra charge, all of our furniture can be made to a bespoke length/width. On some models, we can also alter the depth and height. Our corner-units come in various standard size configurations, however these can be built to exact sizes to fit a room, or wall space perfectly. If you have a question but do not see it here, please send it to us and we will get back to you with an answer.